To date, a number of pending bills intended to improve the lives of children and families impacted by mental illness have been introduced in Congress. To learn more about the advocacy and public policy issues that affect adults and children living with mental illness and their loved ones, click here. Please contact your Federal Congressional Member and urge them to co-sponsor pending mental health legislation. 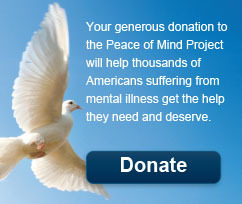 The Peace of Mind Project is your gateway to help people in need. Learn the truth about mental illness and help end the stigma, which has been the biggest stumbling block in getting millions of Americans the proper medical and social benefits they so desperately need. According to the National Institute for Mental Health, roughly 44.3 million people (22.1% of Americans over 18) suffer from some kind of mental illness each year, and 2.8% of those (about 5.5 million people) suffer from a severe mental illness. Mental illness places a burden not only on the afflicted individual, but also upon society. Mental illnesses make up 4 of the top 10 causes of disability and over 15% of the burden of disease in established market economies.